Description: February is the month of LOVE so I thought it would be appropriate to make a hearts-themed layout! I just love this picture of my daughter Jane on her 1st birthday - not even a Valentine's-themed picture, but it matches with the papers oh so well! Journaling says: We celebrated Jane's first birthday in our hotel room, just the four of us. She loved opening all of her books! 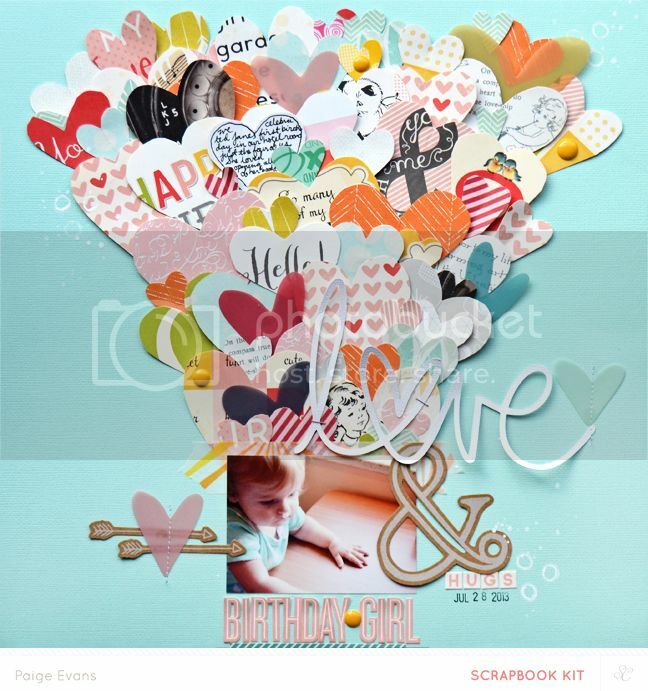 How to: Hand cut dozens of hearts from each of the papers in the Sugar Rush kit by Studio Calico. 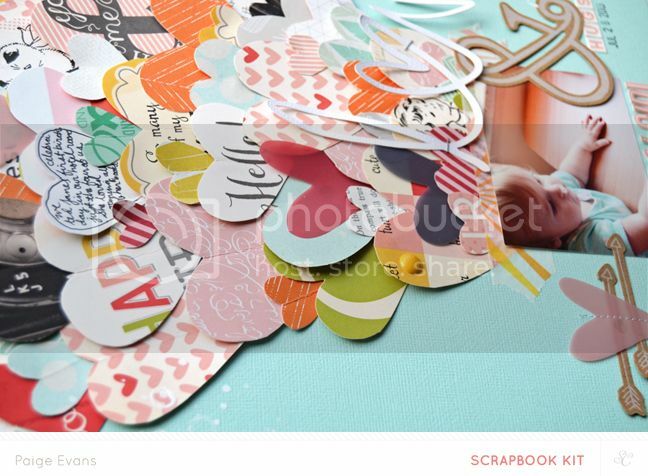 Place a photo at the bottom of a blue cardstock layout base and adhere the hearts going up from the photo in a funnel shape. Place washi tape under the top edge of the photo. 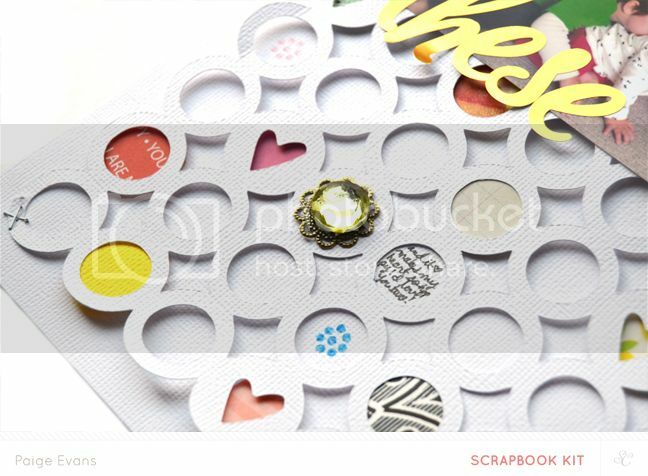 Tuck plastic die cut hearts among the paper ones and add enamel dots to some of the hearts. Die cut "love" from white cardstock and staple it above the photo for a title. Add an ampersand die cut and "HUGS" mini alphabet stickers below the title. Stamp the date under all that. Place letter stickers and an enamel dot under the photo for a secondary title. Add a thin strip of patterned paper below the secondary title. Point two arrow die cuts to the photo on the left side. Stitch a plastic heart die cut over the arrows and on the end of the "love" die cut. Use white paint to stamp three trios of dots on the top right, top left, and bottom right edges. Drop white spray mist over the stamping. Description: As soon as I saw this 12x12 heart circle grid in the February cut files I knew I had to make something with it! I chose to back only some of the circles/hearts with patterned paper/cardstock to help draw more attention to the photos and details. Journaling says: I love watching you two interact and play together. You've been getting along better and it makes my heart so happy! I love you two! How to: Die cut a circle matrix from white cardstock and back all of the hearts and some of the circles with patterned paper and cardstock. Staple the matrix to a white cardstock background. Add three photos to the layout in a triangle and place gold foil letter stickers across the bottom of each picture to make the title. Tuck three transparency feathers under one corner of each photo. Take apart all five hairpins and just adhere the jewel parts to the layout. Place mini alphabet stickers in empty circles across the top two rows for a secondary title and number stickers across the bottom row for the year. Journal in three of the empty circles. Stamp dots in some of the empty circles. Description: The cut files are some of my favorite things in every kit! So many ideas and possibilities! I love that these letters are empty inside - perfect for filling with patterned paper and making a big, bold statement of a title! Journaling says: You make friends so easily - you just jump in and join the fun! 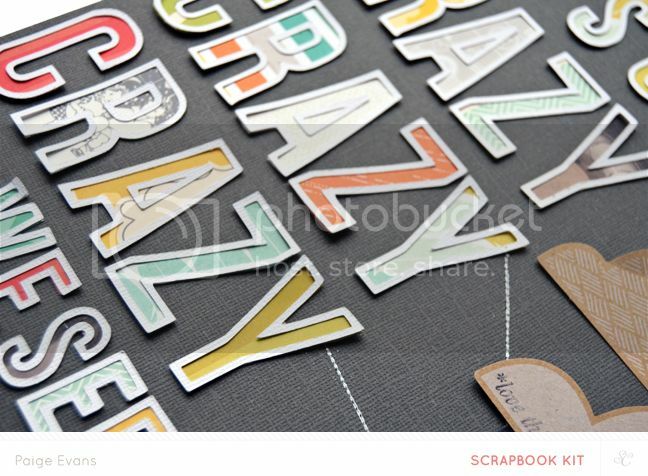 How to: Die cut the title letters from white cardstock then back them with patterned papers. Adhere the title down the left side of a dark gray cardstock layout background. Draw a dot on the right side of the layout and use a white pen to draw sun rays from the dot to the edges of the layout. Stitch over the lines using white thread. Adhere a photo on the epicenter of the sun rays. Stamp lines with white paint on the bottom right corner and journal with the white pen. Add three enamel dots below the journaling. 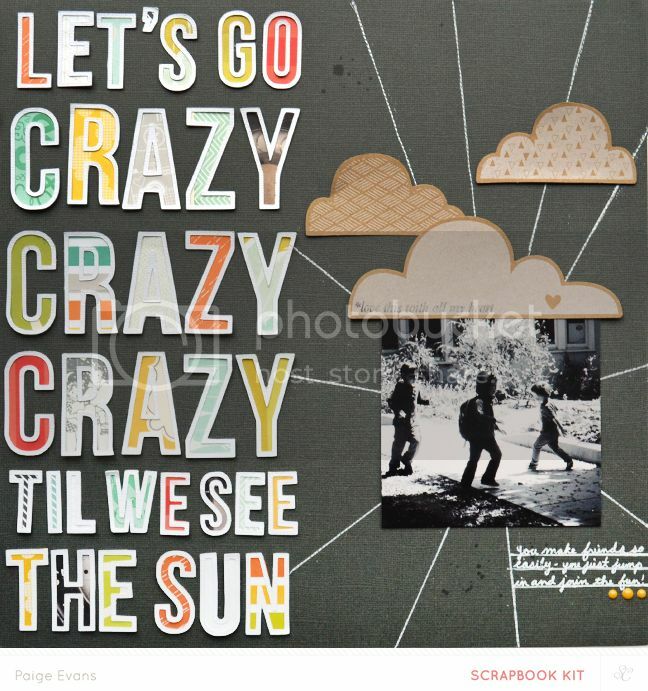 Place three kraft die cut clouds above the photo and stamp a sentiment on the bottom cloud. Drop dark gray spray mist over the layout to finish. Description: I saw an image of sun rays on Pinterest and thought, "Hey! I want to make that with paper!" I love being able to use as much patterned paper as I can and this was a fun way to use lots and draw attention to my photo. Journaling says: Just a little selphy of me and you in the beautiful city of Regensberg. You are such a sweet girl and I'm so happy and lucky to call you my very own daughter. You bring me so much joy and I love watching you grow and learn and play with your big brother. I love you so much sweet angel Jane! Do you know how much I love you? I love you to the moon and stars and back again. You have the cutest laugh and sweetest disposition. You love to color on everything. You devour apples whole! You love candy of course. We love you to pieces and we love you whole. I hope you know that! 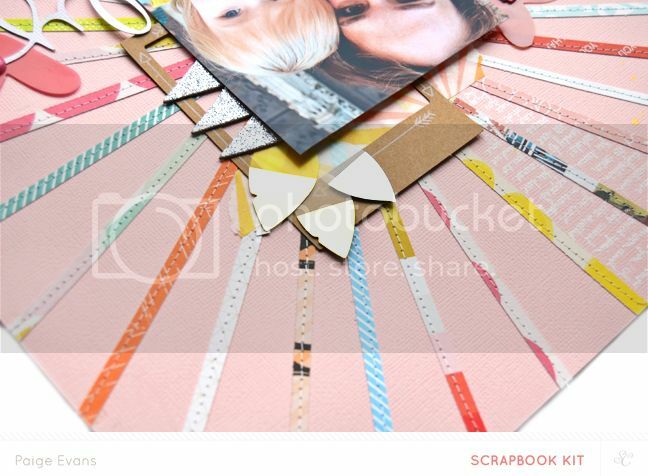 How to: Trim 1/4" strips from each of the papers in all of the Scrapbook Kits (Sugar Rush, Rock Candy, Jelly Beans, and Gum Drop). Find the center of a pink cardstock layout base then adhere the papers in sun rays from the center outwards. Sew down each paper strip using white thread. 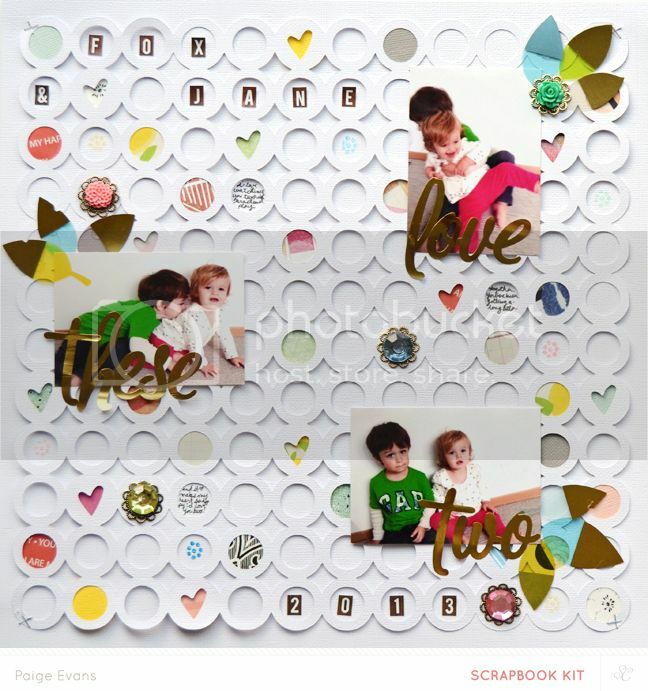 Place two kraft Polaroid die cuts on the center of the layout and top them with a photo. Back the edges with three silver glittered triangles. Tuck three transparency feathers under the top right corner of the photo. 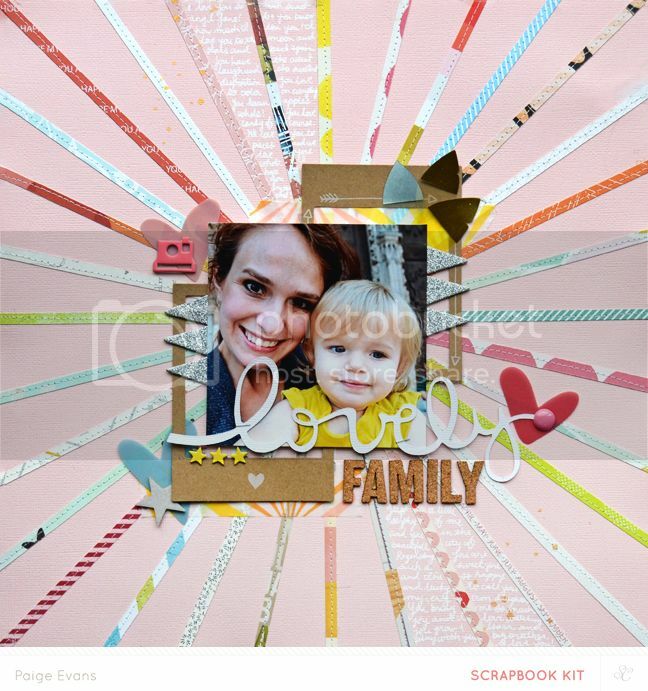 Die cut "lovely" from white cardstock and staple it to the bottom of the photo. Trim the bottom off a cork "family" embellishment and adhere the letters below the die cut word. Place three plastic hearts around the photo and top them with embellishments like a chipboard camera, chipboard star, and enamel dot. Place three chipboard stars under the bottom left corner of the photo. Journal with a white pen in between sections of the sun rays then drop gold spray mist over the journaling. That's a wrap for this month! Ohhhhhh these are gorgeous!! LOVING that first one with all the hearts!!! PINNING!!!!!!!! Love what you did with the Kit, Paige!! Such amazing layouts! I am in love with that first layout... Seriously. It's incredible. You are a true artist Paige. These are pretty dang outstanding! Great work! I love all your pages!! !